There may still be snow in parts of BC, but spring GO Grant field trips are just around the corner! We’ve just awarded $75,000 in GO grants to 216 teachers in 34 different school districts to get more than 5500 BC students learning outdoors this spring. This photo was submitted to us by Amy Woodland Elementary School in Cranbrook. The school used an HCTF GO Grant for its “Wilderness Wednesdays” initiative. 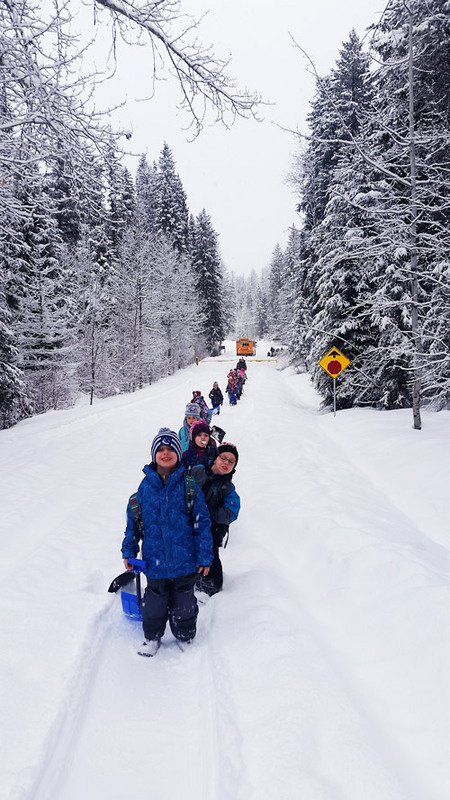 Each Wednesday, the school hired a bus to take several classes to Jim Smith Provincial Park and Idlewild Park to participate in outdoor, place-based learning experiences. The main goal of “Wilderness Wednesdays” was to provide children with regular access to natural spaces for child-directed, inquiry-based learning. Kindergarten teacher Leah Draper reports that the opportunities for learning were endless. “We were fortunate to have guest educators teach us about bats in the fall, and Dave Quinn from Wildsight facilitated the program, Nature Through the Seasons. All of the learning and free-play activities were rooted in the features of and changes in the local forest environment, ” says Draper. Students learned about local plants and animals and how they adapt to changing seasons. They built shelters, had weekly campfire stories, went snowshoeing, ice-fishing, created art from natural elements and played cooperative games. Outdoor education students from the University of Victoria also participated in the field trips to apply their learning with the classes. Teachers have reported increased levels of student engagement and improved student relationships as a result of collaborative problem solving during field trip activities. Students were also allowed time to play and explore independently, providing welcome opportunities for using their imagination. Draper observed Kindergarten students becoming families of wolves and creating and maintaining an icy “otter” slide, as well as constructing numerous “homes” for other animals. The wilderness experience also led students to build resilience when faced with obstacles, including inclement weather. This was the school’s second year of Wilderness Wednesdays and teacher participation has grown immensely. The school hopes to continue getting their students outdoors and plans to apply to HCTF Education’s Wild Schools program to build upon their students’ ecological literacy.